Toss 2 thinly sliced apples, 4 thinly sliced celery stalks (with leaves) and 1 minced shallot in a bowl with the juice of 1 lemon. Peel 1 beet, then slice into matchsticks and add to the bowl. Toss in 1 teaspoon sugar, 3 tablespoons chopped walnuts, 3 tablespoons olive oil, and salt and pepper. 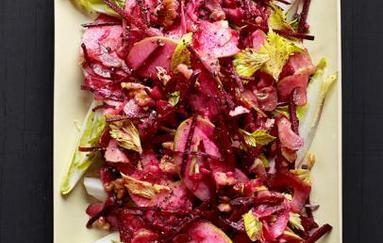 Let stand 10 minutes, then serve on a bed of sliced endive.